Next PostNext Should You Do Brunch in Disney World? We were so excited earlier this week when Disney World announced a special, ticketed evening event starting this June — Villains After Hours! It’s a three-hour event in Magic Kingdom after regular operating hours, featuring the Villains in a new stage show, with other special treats throughout the night. That got us to thinking… of course, all of the Disney Villains are evil, but who’s the worst of the worst, the baddest of the bad, the meanest of the mean? Sure, taxing the poor village people an obscene amount isn’t exactly kind — but look at the guy? Not exactly the stuff of evil. We get that she has a bad temper and possibly overreacts to the color of flowers, but at the end of the day, she’s just a part of a very odd dream. Higher rankings are reserved for villains that are more than just in our heroine’s head. He loses points for trapping Tinker Bell, but any villain who can be outsmarted by a croc with a clock doesn’t deserve a very high spot on our list. Yes, he tries to kill Mowgli. But… he’s a tiger. Can you really blame him? He does try to start a war, but honestly, wouldn’t you be a little bit miffed if you expected to find mounds of gold and you only found corn? The fact that she didn’t actually murder anyone is the only reason she isn’t higher on our list (the bar isn’t very high). Imprisoning your stepdaughter and turning her into a slave is pretty darn evil. Sure, being Lord of the Underworld doesn’t sound like the best job in the universe, but is that an excuse to kidnap and attempt to murder a baby? No, we didn’t think so. Sure, he easily persuaded a mob of people to march on a castle for his own selfish means. But also, he’s a hunter and he was just… hunting. That said, we weren’t sad to see him go. To be fair, Aladdin was lying about who he was. But did he deserve to be sent to the arctic tundra in just a vest? Probably not. Besides, Jafar is ruthlessly trying to take over a kingdom at any cost, and that’s just not cool. Truth be told, this guy scares the bejesus out of us. He’s got actual voodoo magic and evil spirits on his side! The only reason he isn’t higher on our list is because he doesn’t actually murder Naveen (but we can’t forgive him for Ray! ), though he does plot it in his attempts to take over New Orleans. Does Mother Gothel murder anyone? No. Does Mother Gothel have an evil plot to take over a kingdom? No. But is Mother Gothel terrifying? YES. Emotional manipulation is no joke, friends! Plus, there’s the whole stealing a baby so you can remain young forever thing. Hans is just your typical Disney prince, minus the whole “pretending to be in love with a princess so he can leave her to die and murder her sister and take over the kingdom” thing. We know you had 12 brothers, Hans, but yeesh. She wants to murder a bunch of puppies for a coat. MURDER. PUPPIES. Need we say more? Oh, but also, her name is literally CRUEL DEVIL. He burns an entire village, including children, to the ground. Even in a war (that he started), that’s very evil. She calls everyone fools and puts a murderous curse on an infant because she wasn’t invited to a party. Petty? Perhaps. But she’s not called the “Mistress of all Evil” for nothing. She puts a hit out on her 13-year-old step-daughter because she thinks the girl is prettier than she is. And not only that, she demands to see the dead girl’s heart in a box. YIKES. The Evil Queen is the OG Disney Villain, and she’s still one of the baddest. Scar murders his brother in cold blood, in front of his nephew, and then uses psychological manipulation to make his nephew believe he’s responsible for his dad’s death. Yep… that’s evil all right. When it comes to evil, Frollo has done it all! Attempt to murder her innocent baby? Check. Imprison the baby for the foreseeable future? Check. Psychologically torture the boy? You betcha! Attempt to destroy an entire population? Of course! Attempt to murder the boy again? Why not! Frollo is the creme de la creme when it comes to evil. His laundry list of meanness covers everything from manipulation to attempted genocide. For these reasons, he tops our list as the worst of the worst — the most evil of all the Disney villains. Not a crown we’d be proud of. So there you have our rankings of the Disney villains, from least to most evil. What do you think — did we get it right? Let us know in the comments! 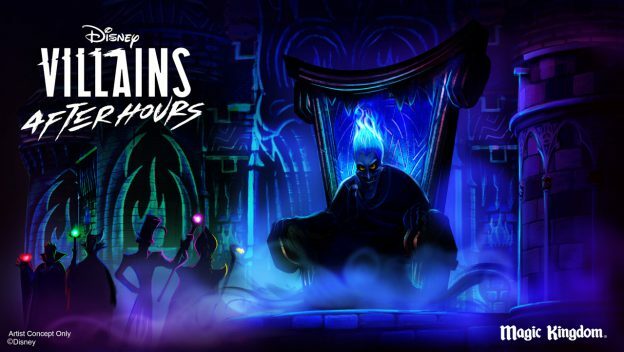 And don’t forget to check the details on Villains After Hours, starting this June in the Magic Kingdom! I appreciate the great try on this, but I feel you missed number one, the Coachman from Pinocchio. He kidnaps young boys, traps them on his island, gives them cigars and beer, rips off their clothes, then sells them into slavery only after they have lost the ability to speak anymore. If they are not fully “donkeys” left and beg for their lives, he cages them until it is so. AND, he never gets caught at the end of the movie…terrifying for young children..
You left out Darth Iger himself, clearly the biggest villain in Disney corporate history! Madam Mim (who strongly resembled my grandmother) scared me pretty good when I was a kid. Missing some villains: The Horned King (we never see it but he’s definitely killed people), Chernobog (didn’t kill but demons), and the Hunter who killed Bambi’s mother often makes it on to lists of worst villains. The coachman from Pleasure Island, even if the boys deserved it, was scary and cruel. Ratigan, McLeach, and the Headless Horseman are pretty memorable as well. I think Madam Medusa really deserves a place on this list. She is scary because she is someone who could really exist. Her terror doesn’t come from magic, but from doing something that happens in real life – kidnaping children. Agreed, she terrified me as a kid! Yes, totally agree with this one! Mother Gothel has that same vanity driven, no redeeming qualities whatsoever personality. And, technically, she did murder Flynn, just to show the length she would go to in order to break Rapunzel. To me, she should be higher on the list. Hold on…wait just one magical minute…Dr. Facilier doesn’t murder anyone? He steps on Ray the firefly!! Does that not count as murder because he’s an insect? You’re so right!! Updated to reflect this injustice.